We were supposed to get through the day without rain, so we ventured out to do some exploring. 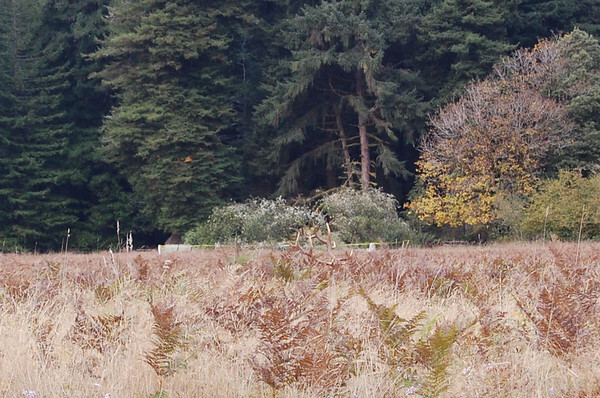 We drove north on Hwy 101 to visit the Prairie Creek Redwoods State Park. 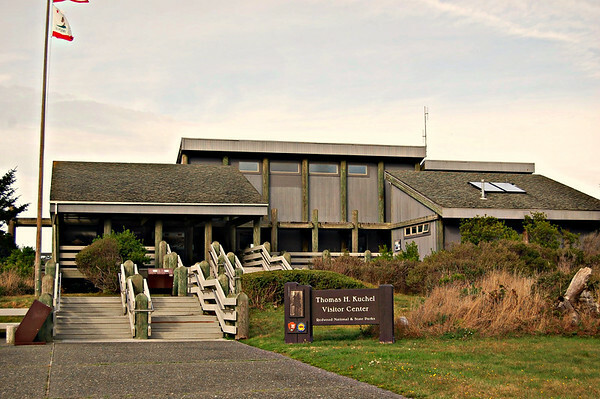 Before getting to the park, we stopped at the Redwoods National Park Thomas H. Kuchel Visitor Center on the ocean just south of Orick. We watched a 12-minute video about the Redwood forests and then got some advice from one of the rangers. The Jedidiah Smith Redwoods Park, the Del Norte Coast Redwoods Park, and the Prairie Creek Redwoods Park, along with the Redwoods National Park, are cooperatively managed by the National Park Service and the California Department of Parks & Recreation. 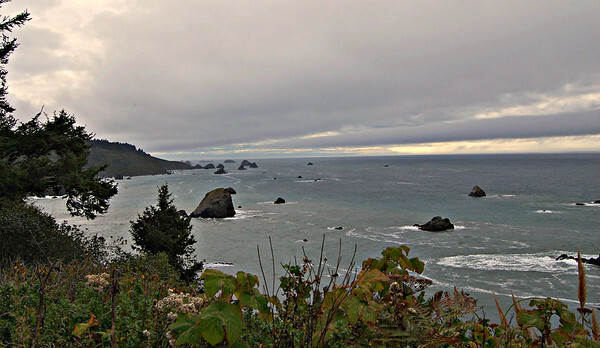 According to the websites, these parks protect 45% of the old growth redwood forests in California. 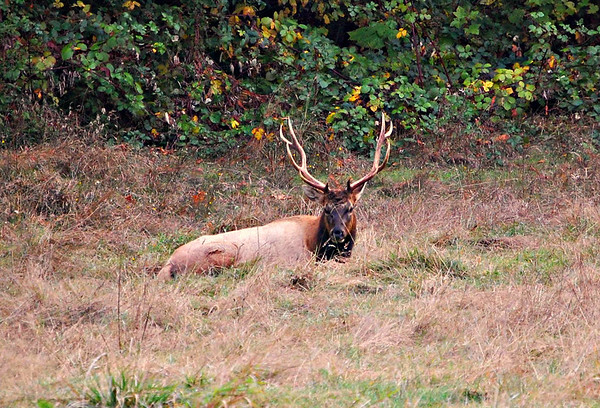 Continuing north, we passed two herds of Roosevelt Elk lounging along the side of the road. We stopped to take photos of one herd. 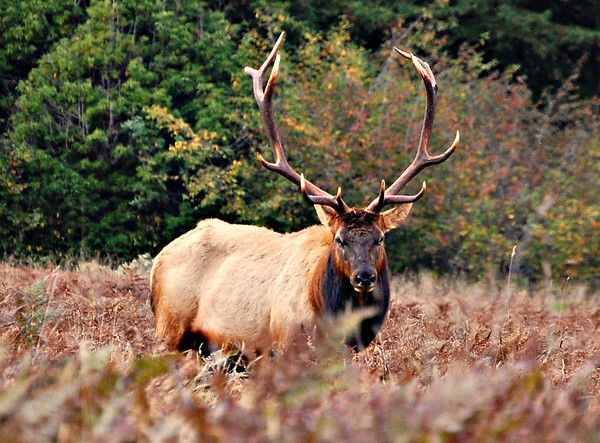 There were signs saying not to approach the elk, so they appear to be frequent visitors in these areas. A little farther, we turned left onto Davison Road. The road is paved for about a third of a mile and that section is a great place for elk viewing. Then the road turns to dirt/mud/gravel as it continues on to Gold Bluff Beach and Fern Canyon. 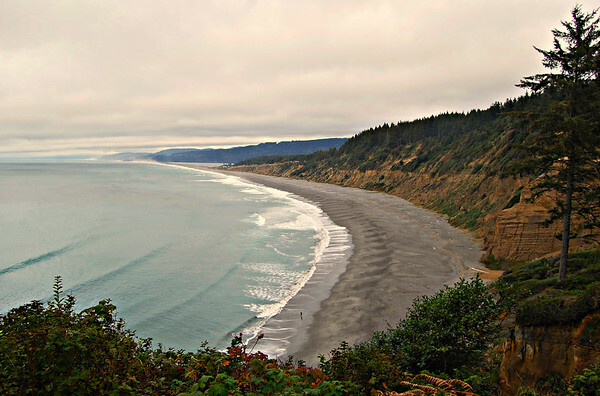 The first four miles are narrow and wind through a thick forest until you come to Gold Bluffs Beach. There is a "day use" fee booth there before continuing on the last three or four miles to the Fern Canyon parking area. No one was at the booth. Federal passes are accepted for camping, but it's not real clear if they are accepted for the "day use" fee. The road doesn't require four-wheel drive, but with the mud and a couple of stream crossings, it was nice to have. 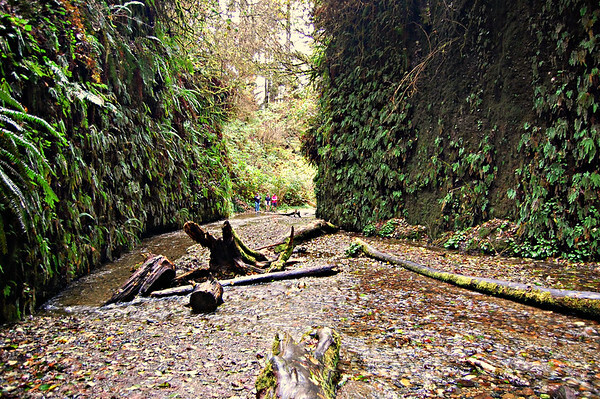 Fern Canyon, though not that easy to get to, is one of the most popular attractions in Prairie Creek State Park. Even on a cloudy Tuesday in the off-peak season, there were three or four cars in the parking lot. It was a tenth of a mile hike to the canyon. As you proceed into the canyon, fern-covered walls close in and it's easy to see why scenes from the second "Jurassic Park" movie were filmed here. Home Creek runs through the canyon, and though not deep, it's pretty much a given that your feet will get wet. In the summer they install foot bridges to make the one-mile canyon hike easier and drier. But those had been removed for the winter, so you either walk through the cold water of the creek or you navigate over strategically placed logs and rocks (and will still probably get wet). I'd recommend some waterproof boots or just wear water shoes and tough it out - walking and hopping across the wet rocks and logs is a little tricky so it takes more time and increases the chance of injury. Having Linda's hiking poles helped with maintaining our balance as we crossed some of the logs. There are a lot of downed trees to work around and, since we didn't bring water shoes, we didn't go very far up the canyon. 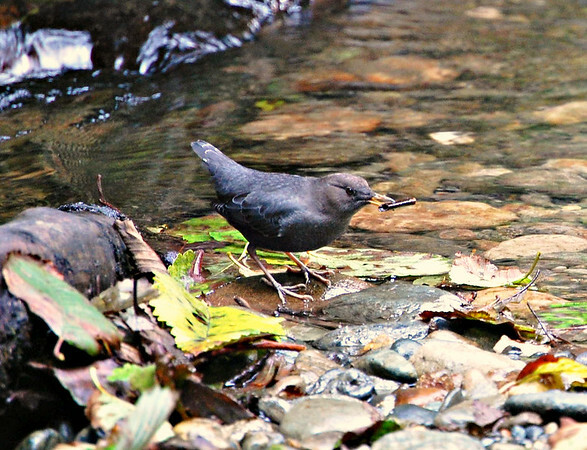 But we spotted an American Dipper, one of our favorite birds. 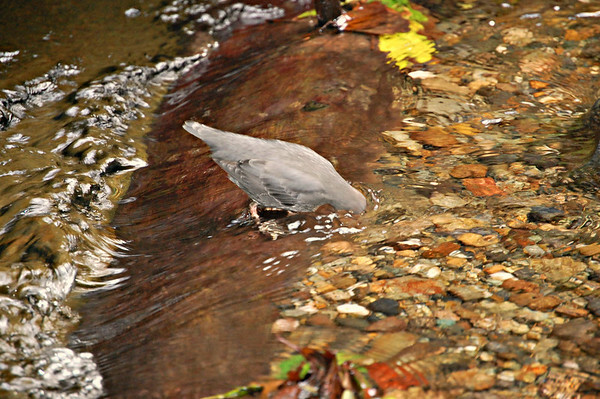 This little gray bird of the west, is a swimming, diving, songbird that frequents streams and is often found near waterfalls, cascades, and rapids. This one was the most people-friendly Dipper we've seen. It allowed us to watch it feed for several minutes. 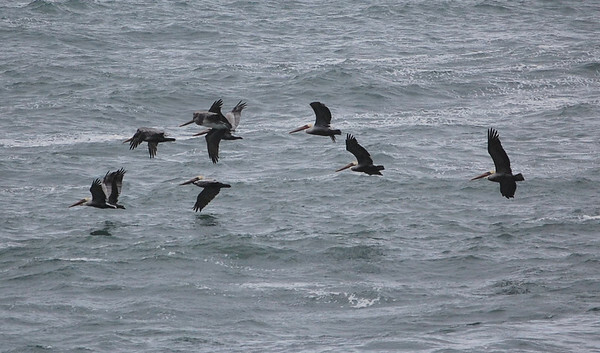 This bird wades like a shorebird, swims like a duck, and dives under water like .... well, birds that dive. Folks often don't believe us when we tell them a songbird does all that, but this time we were able to get it on video. It dove underwater, grabbed a stick, floated back downstream, hopped on a log, and beat the heck out of the stick until a worm popped out. Very cool. 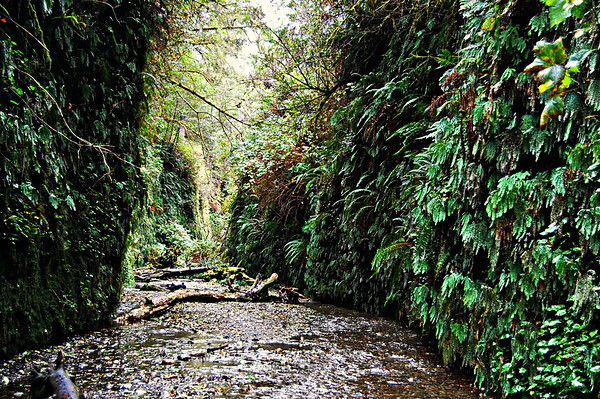 For us, that was worth the trip to Fern Canyon. On the way back to the Jeep, Linda searched for Banana Slugs. We kept reading about them, but hadn't yet seen one. Finally, my slug-spotter found one on a tree. This was a big deal at the time. 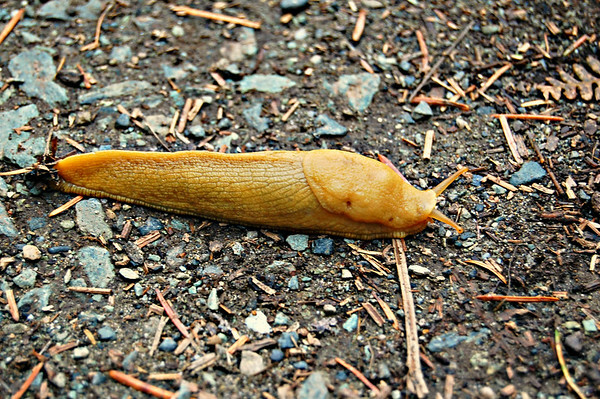 It wasn't yellow as expected, but it was, nevertheless, our first look at a Banana Slug. 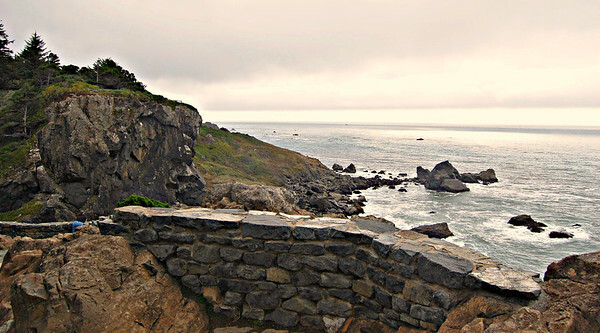 After returning to Hwy 101, we continued north and then took the exit for the Newton B. Drury Scenic Parkway. 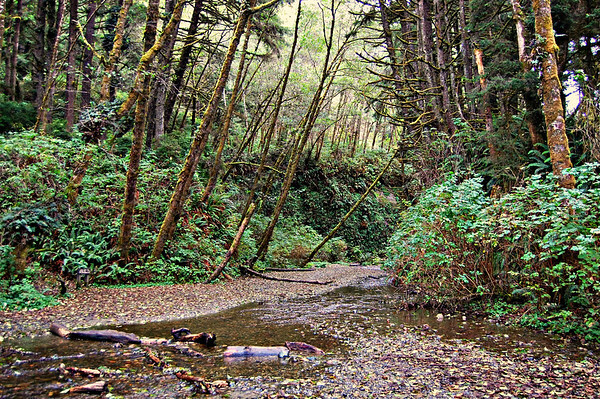 It's a 10-mile scenic stretch through some of the best redwood groves anywhere. But the south end starts through meadows where elk are likely to be spotted. I managed to catch a glimpse of two sets of antlers sticking out above the vegetation. We stopped and one of the big fellas got up. Very nice. It seems that elk are pretty easy to spot in this area. 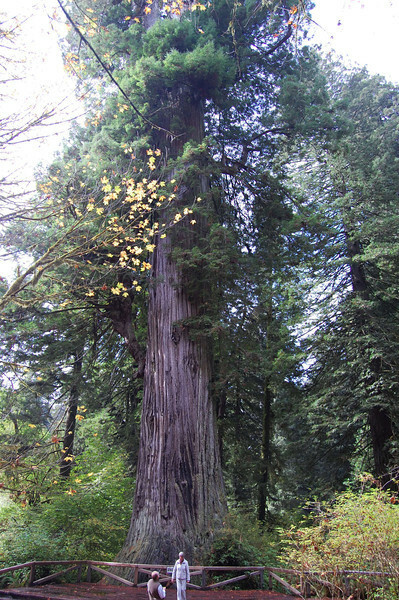 to a 300-foot high, 21-foot diameter redwood. As big as that tree is, it's about 70 feet shorter than the tallest tree in the world which is found in the Tall Trees grove. 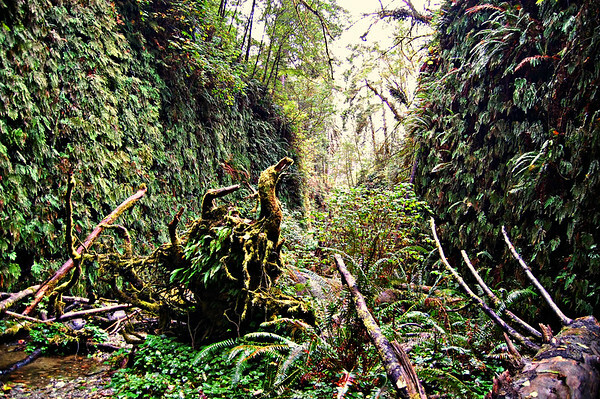 The Tall Trees grove isn't too far away, but that grove is protected and requires a permit to get to. The 370-plus-foot tree that claims the title was discovered recently (2006), and it would have been nice to see it. But, it wasn't easy to get to, and I'm not sure a tree that's 50 feet higher than lots of other trees we've seen would be impressive enough from the ground to make the trip. On the way back to the Jeep, Linda found another Banana Slug. This one seemed to be sleeping, but it was the brighter yellow color we were expecting. We finished up the drive on the scenic parkway. 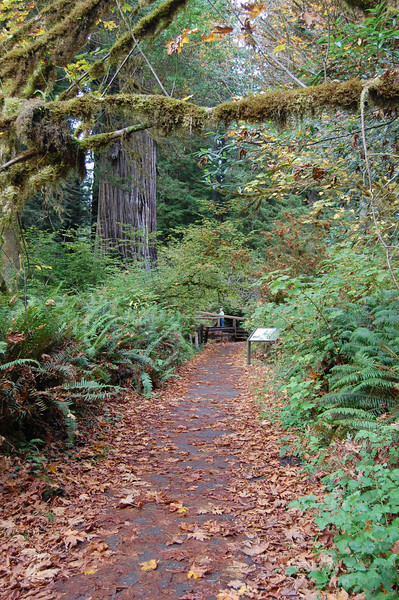 There are over 70 miles of hiking trails in the Prairie Creek Redwoods Park, and many trailheads are on the parkway. But as magnificent as the redwoods are, viewing them can become rather monotonous. We skipped some other redwood highlights and made our way back south to spend some time in Patrick's Point State Park which is about a mile from our campground. 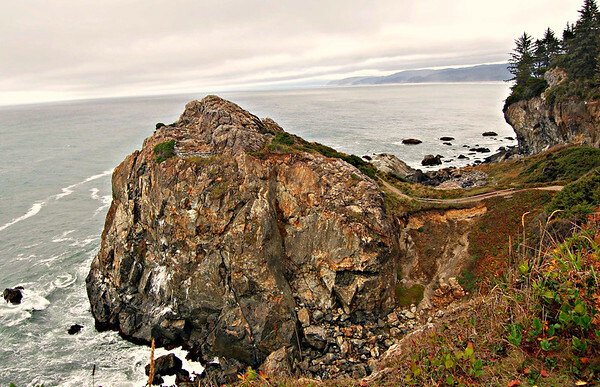 At the park, we drove to the Palmer's Point on the south end, where you are most likely to see Sea Lions and Harbor Seals and where you can walk down and explore the tidepools. we could definitely hear the barking of the Sea Lions and we could see them with the binoculars on a small rock near the largest rock above. We can also hear that group from the RV park. is a trail leading down to the beach and tidepools. 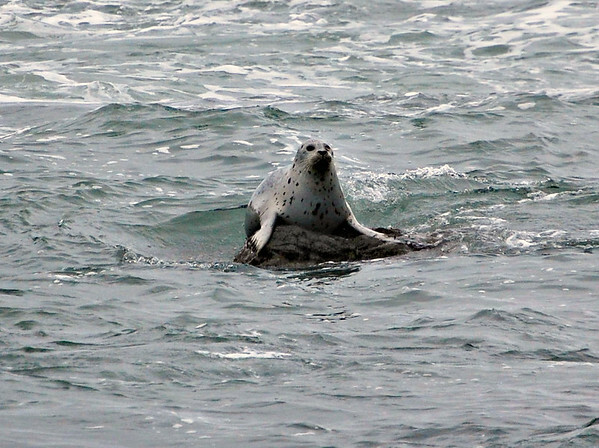 We walked down the numerous steps where a large Harbor Seal greeted us with a few grunts. 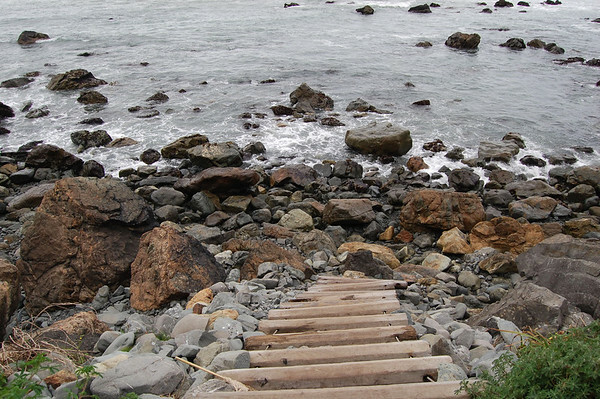 Unfortunately, low tide wasn't for another three hours, but I climbed down the ladder to the rocky beach anyway. 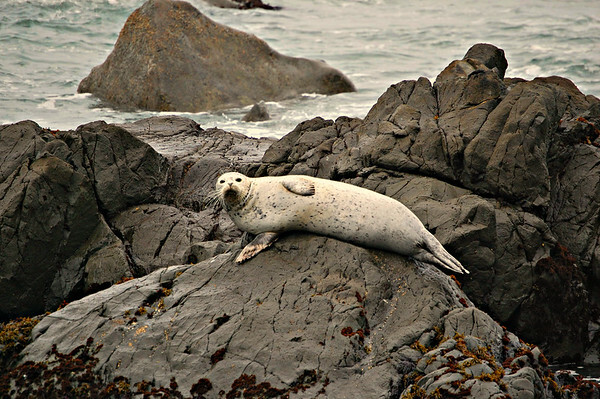 The tidepools just weren't exposed enough to explore, but I walked along and watched other seals bobbing up and down. This one popped up on a rock briefly. 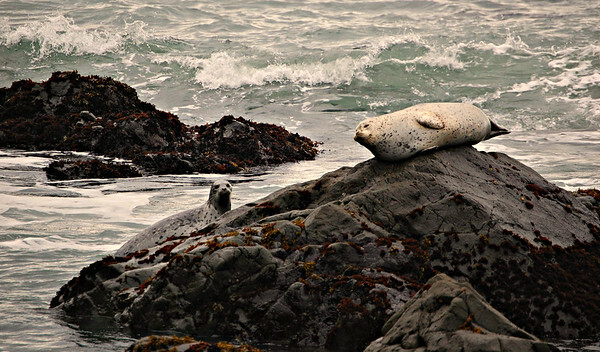 The first seal we saw shifted on its rock to make sure it could keep an eye on me, and another seal joined it. 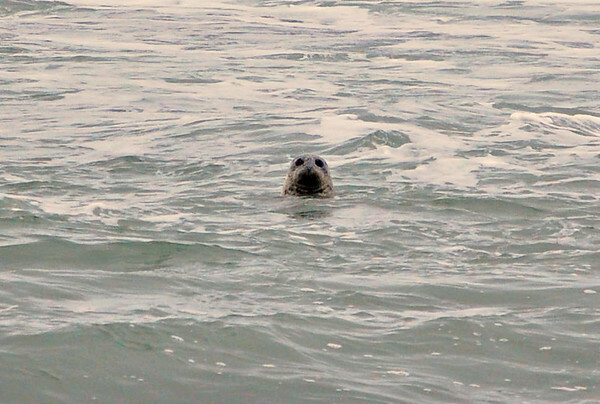 But it was more skittish and plopped back in the water as I walked by. for awhile, we hiked back up all the steps to the parking area, and we drove to another part of the park. We parked and walked out onto Wedding Rock. and would certainly make a great place for weddings. This is Wedding Rock looking out from Patrick's Point. 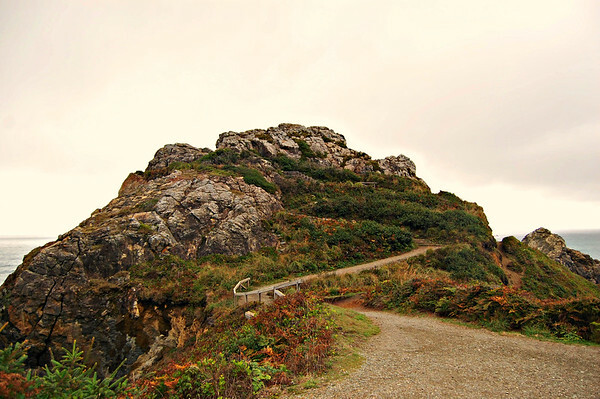 Now the trail between Wedding Rock and Patrick's Point is easy and pretty. But what we noticed most was that our earlier-in-the-day discoveries of Banana Slugs was nothing to be too excited about. On this short walk, we probably saw fifty of the slimy little creatures. I mentioned to Linda that I was pretty sure one of the California colleges had the Banana Slug as a mascot. Ah, my memory served me correctly. 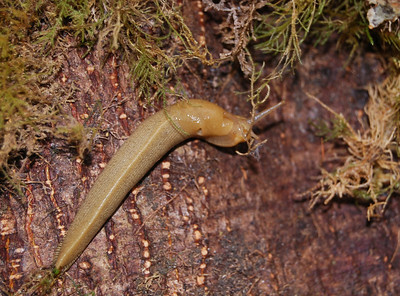 It's the University of California Santa Cruz - and there is an interesting little story on their web page about Sammy the Slug. Before leaving the park, we drove through part of the campground where there is a "day use" parking area and a trail leading down to Agate Beach. By then, the rain was threatening and we had hiked up and down the cliffs and rocks enough, so we just took in the view from the overlook. This park had a very tranquil feel. Of course, it's not exactly peak season and we didn't see anyone else on the trails. 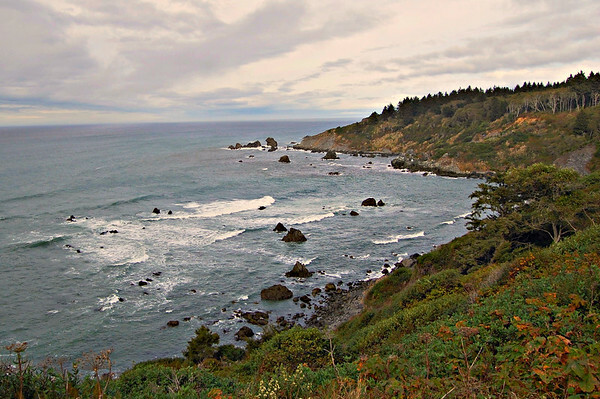 I do like the feel of this northern California coastal area and there seems to be lots of nature activities in Humboldt County. But redwoods thrive on coastal fog and winter rains and, although it's currently uncrowded, this may not be the best time of the year for a visit weather-wise. 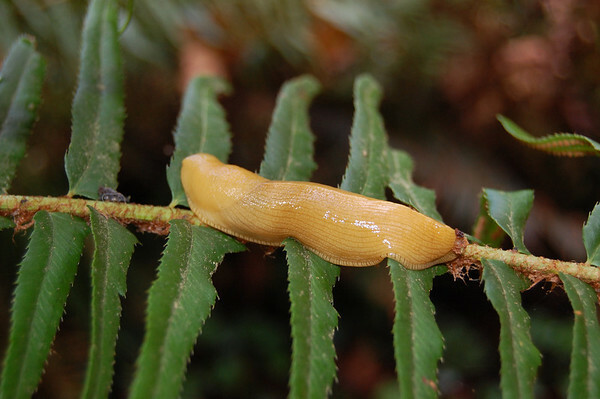 Still, we had a fantastic day - redwoods, ocean views, elk, seals, American Dipper, and .... Banana Slugs.